With too little time to follow the events in Egypt closely, I can’t add much to what other blogs and news sources are saying except to point to a few sources I’ve been finding useful, and to connect them up to some themes and discussions this blog has featured. In a process-relational view, all that there are (essentially) are moments — relational alignments opening up onto particular sets of possibilities, of which some become actualized and others do not, through the activity of the singular points of agency woven into each of them. But revolutionary moments are big moments, those in which many highly dynamic processes converge to create possibilities for radical change spanning layers and levels of activity that rarely get aligned all together in one fell swoop. Moments like these take a lot of preparation to become possible (an indication of which is the Egyptian activists’ action plan), but they also arrive very much of their own accord, an alignment of stars as much as of anything else. In the midst of such moments it is impossible to tell where things will end up. What will be the shape of the new constellation that emerges once the dust is settled? Which social and political groups will take power into their hands, or what kind of redistribution of power will occur? Which figures, and which slogans and ideas, will rise above the others? Which elements (e.g., the military, the police, etc.) will turn against their traditional allies or masters, and which will not? Or will it all slide back into a hardened and more brazen authoritarian grip for another few years or decades? When there is so much in play, the possibilities for change — for high-amplitude remodulation, quantum leaps and unpredictable reconfigurations — reach the level of a chaotics that cannot be controlled by any single player. This is when the cosmos is really and truly a chaosmos, a fluctuating order that is generative of novelty on such a scale as to be out of anyone’s hands. Agency is splintered along a million points of light, points that can only be coordinated through an affective resonance and a momentum that is notoriously difficult to shape and direct. I’ve written about such moments before (e.g., about Tehran 2009, or about COP-15 as a potential turning point in global social and environmental politics) and tried to fit them into an understanding of time as cyclical yet always differentiating. Many such moments do not go the way those most involved in them would like them to go. The East European revolutions of 1989-90 left behind a mixed legacy, but only a die-hard Bolshevik (of the Stalinist or Leninist variety) would argue that they didn’t open up a lot of possibilities that, whether realized so far or not, are much better left open than bottled up as they had been under Soviet rule. All through these events, however, there has been a more general movement of democratization and activization of those left out of traditional oligarchic power-holds. And however much we may celebrate modernity as an era of democratization, the world is still made up largely of variations of oligarchy interlocking at multiple levels. Oligarchy, however, unlike bone-crushing authoriatarianism, usually leaves many gaps, breathing spaces, within which resistance can build, and what we’re seeing is the result of the convergence — the (literal) con-spiracy, the breathing together — of some of those breathing spaces. Nathan at Dangerous Harvests is correct in noting a parallel between these events and those which brought down the Soviet Union twenty years ago. I would argue further: these events are part of the same process, a process of people — Hardt and Negri’s multitude organized as a kind of pluralizing yet at times convergent socium — emerging, piece by piece (that is, nation by nation, though only in a superficial sense), as a global force. While the particular mixtures of ideas that inform them vary widely (as do the role of Islamic or other religious sentiments within them), all of them include as a central thread the call of (and for) self-determination. (Or “the will of the people,” as Peter Hallward puts it). And events like these, especially when they succeed, are exactly the kinds of things that get imitated in other places equally ripe for change. 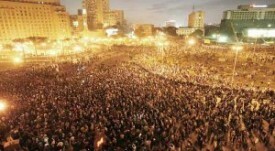 What are the forces at play in Egypt right now? What role do Islamic organizations like the Muslim Brotherhood have, as opposed to secular, leftist, and youth groups (which reportedly have been instrumental in catalyzing the events in Egypt), among others? The level of on-the-ground organization — not just in the demonstrations at Tahrir Square, but in neighborhoods around Cairo and other major cities — seems very impressive, and, on the surface at least, this organization doesn’t seem to bear the stamp of “Islamic radicalism” in the way that Western observers fear. The main go-to place for English-language news appears to be Al Jazeera English with its Egypt page and its live video stream. The Guardian, Democracy Now (which has had some excellent interviews the last couple of days), Occupied London’s Reports from the Egyptian Uprising blog, Common Dreams‘ Egypt feed, and Global Voices provide useful supplements to that coverage. Antonio Lopez at Mediacology compares today’s Egypt with Barcelona during the early days of the Spanish Civil War, citing Orwell’s description of the “spirit of cooperation and brother/sisterhood that permeated cafes and barber shops alike, one in which a temporary autonomous zone of human potential was freed from the restraints of state terror and mechanized control. To behold such a space is a beautiful thing. To live it is a miracle. To unlearn it is impossible.” The latter, I’d say, is the take-home message of all such uprisings. Andy Revkin and others have pointed out the role of booming cell phone use (quite apart from Facebook and other social media) as an explanation for how the Egyptian and Tunisian uprisings have been orchestrated. Graham Harman has been covering events surprisingly well, given that he’s been in India, not in Cairo (where he lives). And with Graham, I can’t help being impressed by Wikipedians’ swift and detailed chronicling of the events. And while Slavoj Zizek’s piece on the events is less lucid than much of his political writing, his citing of Mao’s motto — “There is great chaos under heaven – the situation is excellent” — is both very à propos and (typically) incendiary, or at least groan-inducing to those who have tired of his genuflections toward authoritarianism. If the situation is excellent, it is so both for the Maos (and Stalins and Khomeinis) in our midst and for those who would build something new and different. The latter is much more difficult, alas, but the efforts to do it are the ones that expand the collective capacity for a genuine humanity and a genuine democracy — “a new people and a new earth,” in Deleuze and Guattari’s words — to emerge. Thanks to Progressive Geographies, An und für sich, and the others I’ve linked to here, which I’ve benefited from reading while thinking about these events. And a quick postscript: I just noticed that Jodi Dean has posted the same photo as I have (above) with her “Lessons from Egypt” of a few hours ago. The lessons are worth checking out.